With Thanksgiving only a week away, we've been busy figuring out our plans to see both my husband and my family. My son is eagerly awaiting the day that we tell him it's time to load up the car and make the drive to grandma's house. He loves his grandparents, cousins, aunt's and uncle's and has been asking me over and over when will Thanksgiving be here so we can see them all. While Thanksgiving can be a lot of work with cleaning and preparing food and even stressful as family comes together, I love this holiday. 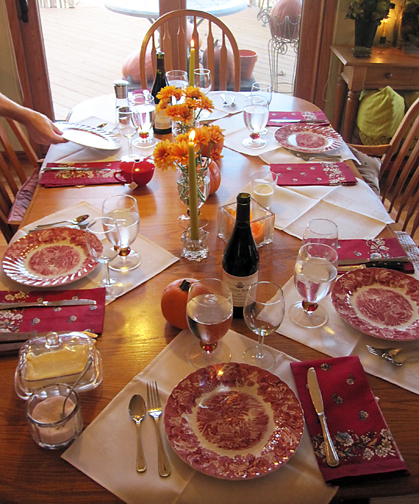 Growing up Thanksgiving was most often intimately spent with my parents and younger brother. My dad traveled a lot while I was growing up, but Thanksgiving day he was always around. My mom was and is a fantastic decorator (and cook of course ;D) and one of the things that brought her great joy and us as well, was to have our home beautiful, clean, with nice music playing and tantalizing aromas drifting from room to room, with an elegant table set with our fine china and crystal. It was always such a treat as a child to see everything so stunning. Things have become a bit more low key as we've all grown older, but the joys of being together and enjoying fabulous food is still wonderful all the same. Those darn turkeys... no matter how much you try, each year doing your best to perfect your roasting skills, sometimes they just don't want to get done. :-) One year I remember us waiting so long for the turkey to finish roasting, literally that bird had been in the oven all day and just didn't want to get to the right temperature, that by the time is was ready to eat it it must have been close to 10-o-clock at night. My brother and I were so tired we could hardly hold our heads up and in the end couldn't hardly eat a thing. 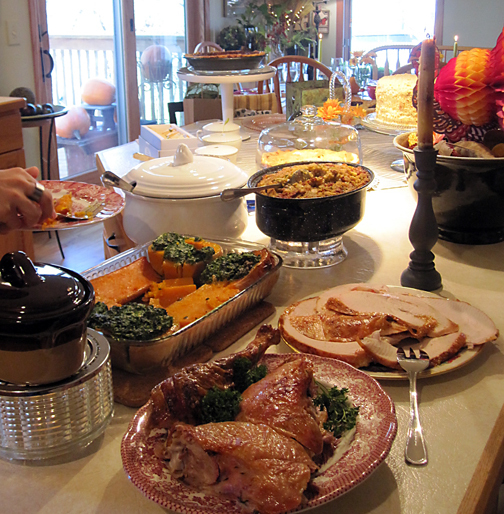 Needless to say, with A TON of leftovers, we had our Thanksgiving meal the next night. It's happened often enough that the turkey just hasn't wanted to get done, that it always a joke to see what time we'll partake in our delightful, all be it, perhaps late evening meal. 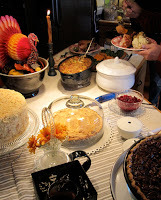 I remember on one occasion where the turkey did get done, we had gathered together at my uncle's home. All the aunts, uncles and cousins were together, a rarity that I truly wish could happen more often. My mother was getting the turkey ready and began pulling out the insides before preparing it to be roasted and start to make her fabulous gravy. Instead of the normal neck or gizzard coming out, there was actually a whole turkey head, feathers and all. Talk about startling, disgusting and hilarious all at the same time. Mind you this was a standard store bought turkey, not one from a farm, where you might want to "extra' piece. At that point in our lives the idea of butchering our own animals was far, far from our mind and seeing the turkey head (we'll just hope that the head and body actually belonged together) did a very good job of taking a bit of our appetite away. Every year we try a new turkey recipe and different techniques, but have yet to find one that I think is so outstanding that I feel I must share it. So for now that will have to wait, however, over the years one thing I have loved to do is bake and learning to bake the ultimate pie has always seemed to go hand in hand with Thanksgiving. I think there is a bit of an art form to pie making and a whole lot of love. It takes practice, but once you figure out a great technique and recipe the end results are so delicious and satisfying that it makes the not so great turnouts worth it. There are plenty of recipes out there that focus more on the decorative side of pie making with the pretty details you can do or add. While that can be fun, sometimes the flavor is forfeited for the looks. I kind of like the simple, classic looking pie that leaves everyone with a smile on their face after eating one, then two and just perhaps, since it's a holiday, three slices of pie. The classic pie has a homey and inviting feel that lends to that desire to sit down and relax, while sipping on a hot cup of tea and enjoying good conversation and a fun game or two. That, to me, is a wonderful end to a fabulous day. This particular recipe was adapted from one I found in the magazine Real Simple a couple of years ago. The ginger is subtle, but adds a wonderful depth of flavor. Even if you aren't a ginger fan, I think you'll still love this pie! Thanksgiving is a time for family, friends, joy, laughter, memories and of course food, but most importantly it's a time to remember to be thankful. So many of us are blessed with so much, even if it seems little in the eyes of the world. Stop, reflect and consider where your blessings are at and be thankful. I know that each day as I pray to my Lord and Savior He shows me how I have been blessed. If you have children have them join you in saying what they are thankful for and share around the table. It may be a bit uncomfortable at first, but who cares, start new memories, seek out the blessings and find joy in what you can be thankful for. That's what this holiday is truly about. Use less sugar if you don't mind not have quite as sweet of a pie, although it will still be more than sweet enough for most taste buds. 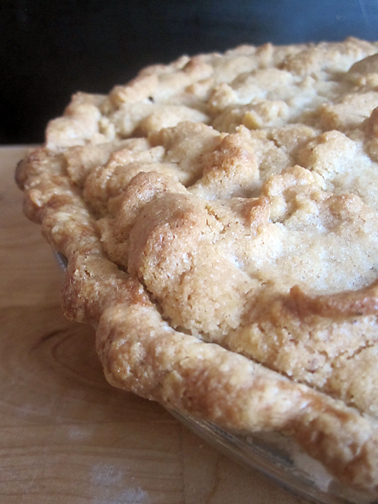 If possible make your pie crust the day before. At the very least it needs 30 minutes to chill in the refrigerator before it can be rolled out. You'll be far happier with your end results if your dough has significant time to chill. I always make a couple batches of pie crust at one time and put the extra in the freezer until I'm ready to use them. Typically they take 12-24 hours to thaw out and be ready to use. If you don't have a food processor you can still make this crust, but use cold butter instead of frozen. There is a bit more dough in this recipe than in most standard ones. That's because I like to have a bit of excess to work with, especially if you have a deeper pie dish. Any extra dough can be rolled out, sprinkled with cinnamon and sugar and baked in a 350 degree (F) oven until lightly browned on the edges. Yummy! 1. Combine your flour and salt in the food processor. With a sharp knife chop your frozen butter into 1/4" or so chunks and add to flour. 2. Process the butter until you have a mealy texture with the flour and butter combined together. 3. With a couple quick pulses with the food processor add the cold lard. You want to have the lard nicely distributed in, but you don't want to process so much that it starts to clump together and form a ball of dough. 4. Add ¼ cup of the ice water, pulse a couple of times and then add 1-2 tablespoon of water, pulsing a couple of times after each addition until you have a dough that can stick together. Don't over process! 5. Divide dough in half and form into a 1" thick disk. Wrap in plastic wrap and place in the refrigerator until you are ready to use it or for at least 30 minutes. 6. Preheat oven to 375° F. Once chilled roll dough out on a floured surface so that it's at least 3" larger than your inverted pie pan. Work fast and handle the dough as little as possible to help it stay cold and insure that you don't have to use much flour in the rolling out process. 7. Loosely roll your dough onto the rolling pin and then unroll on top of the pie pan starting at one end. 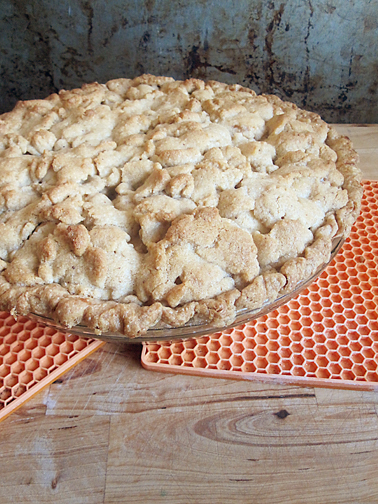 Gently push pie crust into pie pan so that it nicely fills up the corners. 9. Cut of excess dough leaving a 1" overhang. Finish the edge however you like, but what I do is roll the extra 1" of dough underneath so that you have a smooth and extra thick curved edge. Then I use my fingers to do a normal fluted edge. 10. Place the crust in the fridge while you make the topping and filling. 1. In the food processor combine the flour, sugar, cinnamon and salt until mixed. 2. Slice the cold butter into 1/4" chunks and add to the flour mixture. Process until a ball of dough has formed. 3. Wrap dough up and place in the refrigerator. 1. Peel, core and slice your apples. I like to slice my apples to about 1/8" thick. 2. In a large bowl combine the apples with the sugar, flour, ginger, cinnamon and salt. 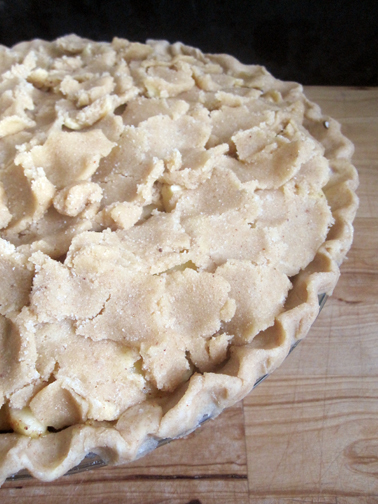 1.Take pie crust out of the fridge and fill with the apple mixture. Try to lay the slices in even layers so you don't have large gaps anywhere. 2. Remove pie topping from refrigerator. Take pinch fulls of dough off the ball and flatten them out with your figures. Starting on one side begin to cover the top of the pie with the irregular shapes of flatten dough, kind of like putting tiles on a roof but not that precise. Alternatively if your dough is crumbly enough you can crumble it over top of your pie. 3. Place a pan under your pie (for those just in case spills... there is nothing worse than going through all that effort and then having the juice or butter boil over and start smoking in the oven). Cook pie on the bottom rack of oven for 50 - 55 minutes or until crust is golden brown and apples or soft. 4. Allow to cool for about an hour before serving. Enjoy! I know, I know, I made you scroll down past all my rambling and a whole recipe before sharing the details of the giveaway. So sorry... well perhaps not, but now your here so let's talk giveaway. I am participating in Macy's Recipe Share and along with it Macy's has generously said they'd like to give one of my readers a choice of four fantastic prizes. You can have 4 chances to win. Leave a separate comment for each chance and if you are already doing one or more of these things, so worries, still leave a separate comment for each and we'll count it as good! 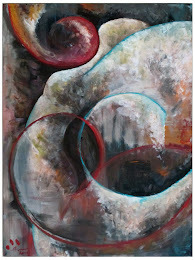 For 1 chance - "Like" Artistta on Facebook or follow with Reader or a similar application. 2nd chance - Tell me your favorite holiday dish or recipe. This contest is open Friday, November 18th and will run until midnight Sunday, November 27th. The winner will be chosen using Random.org. I will announce the winner on this site Monday, November 28th. Happy Thanksgiving everyone! 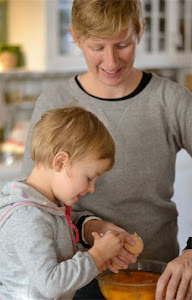 Oh, and I'd love it if you cast me a vote on Macy's Cook.Share. Celebrate Recipe Contest Facebook page. Also, to see some other giveaways, check out Contest Girl (http://www.contestgirl.com/). I like Artistta on fb. I like Macy's recipe share on fb. My favorite dish and honey glazed ham. My favorite holiday dish is Dutch Apple Pie. My favorite holiday dish is stuffing, the plain kind made with bread crumbs, onions, celary and chicken stock. My favorite dish is apple pie. I love, love, love pumpkin pie. I love when we switch out the Turkey for a lovely prime rib roast! Like Macy's Recipe page on FB (Contest KAO). Thanks. My favorite holiday dish is weird, but I love the horrible canned cranberries that actual come out in the shape of the can. My favorite holiday dish is stuffing with gravy. I like Macy's on Facebook (Deborah Rosen). I liked Artistta on Facebook. I liked Macy's Recipe Share on Facebook. My favorite Thanksgiving dish is savory stuffing. ok, i think i'm following it... i did something. My grandma has perfected her apple crumb pie, I LOVE it! My favorite holiday dish is my mom's cornbread stuffing. I liked Macy's recipe contest as Susan Chester. 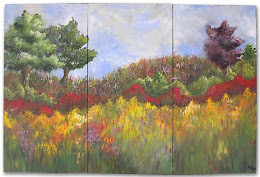 I like macy's on fb and like their recipe contest as Dee G.
I "Like" Artistta on Facebook. My favorite holiday dish is the stuffing from the turkey. 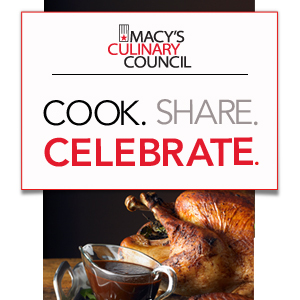 I "Like" the recipe share facebook contest that Macy's is hosting. 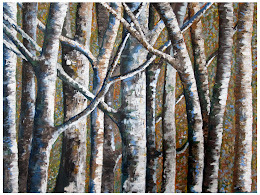 I like Artistta on Fb, monica powell! My new fave dish is making fresh cranberry sauce! my favorite holiday dish is my Grandma's Apple Crisp! I like Artistta on FB (Sarah Smile). The only time of year we make Amaretto Chocolate Cheesecake is during this holiday season, so for me, that's my seasonal favorite. I like Macy's Recipe Share on FB (Sarah Smile). I love baked apple pies and pumpkin pies. my favorite holiday recipe is making a turkey breast instead of a whole turkey. so much easier and less mess to deal with. I liked Macy's Recipe Share on FB! - and voted for you! Delish! Subscribed to M Blog via RSS! For me it's all about the stuffing. My favorite Holiday Dish is the meringues and chocolate sauce my mom sometimes makes at Christmas! I follow Macy's MBlog via rss feed and I registered for their blog as gnwg! I lkd Artistta on FB. Dorothy Hubbard. ladyvon at grm dot net. For me it's the stuffing that I have made for over 40 yrs. ladyvon at grm dot net. I lkd Recipe Share on FB. Dorothy Hubbard ladyvon at grm dot net. My favorite Holiday dish is homemade mashed potatoes! Thumbprint cookies real butter, flour, sugar,very buttery and jelly in top. Oh my gosh, so yummy! My favorite holiday dish is Sweet Potato Casserole. I love our family's recipe of Thanksgiving dressing. I liked Artistta on facebook. and the Macy's blog. My favorite holiday recipe is stuffing. I like to do the Racheal Ray Stuffin Muffins. I will jus tmake a basic cornbread stuffing but bake it in my cupcake tins. that way it already a portion size but everyone gets a crunchy topping as well. Aunt Marys chocolate meringue pie is my favorite. She won't give the recipe - to anyone. Sigh. My favorite dish would probably be my home made cranberry orange sauce. My favorite holiday dish is potato salad. 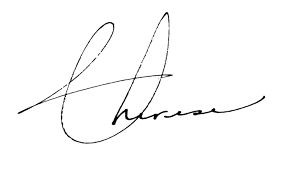 I like you on FB and following you on GFC! My favorite holiday dish is either my mom's candies yams or her pecan cream pie! I like Macy's recipe share on FB! That apple pie looks delicious! My favorite is pumpkin pie. Thanks for having the contest! My favorite holiday recipe is a cranberry apple oatmeal breakfast casserole that my mom has always made Christmas morning! My favorite holiday recipe is cranberry apple cobbler made with cinnamon imperials and served with French vanilla ice cream. My favorite dish is homemade Banana Pudding. Follow MBlog via Twitter @Naddez. Liked Macy's Recipe Share FB page - Quanda. Anything with apples in it is a fave for me. My favorite holiday dish is my mom's dirty rice. ...favorite holiday dish is Cornbread-Sausage Dressing ! 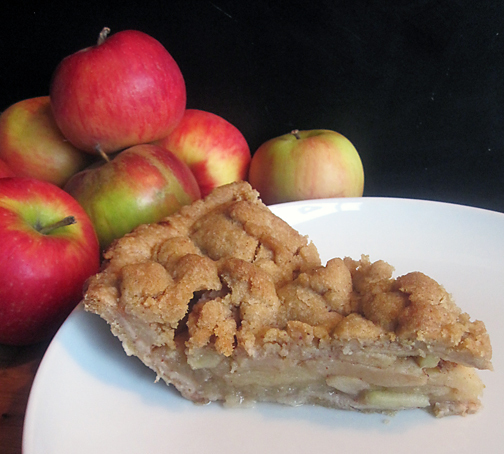 My favorite at the holidays is Dutch Apple Pie!